Born in Barisal, East Bengal, now Bangladesh, and brought up and fed on the folk songs of the boatman — Bhatiyaali and Baul — octogenarian Anil Biswas is the senior most living legend of the Indian cinema music. He is reverently called Anil Dada, Bengali for big brother — or just Anilda (short for Dada). He rightly calls himself the Uncle of modern film music “If RC Boral was the father of modern film music. I am senior enough to be at least its uncle,” he says. As a child his favourite pastime was to learn Bhajans from his mother who, in his words “possessed the sweetest voice I ever heard” Once the Bhajan sessions were over, young Anil (which means breeze in Sanskrit) would wander in the forest or by the river singing his favourite songs in the company of his best friend, Pannalal Ghosh who was destined to become India’s finest flute player. Ghosh married Biswas’ younger sister Parul, the renowned singer of the forties. In the rich cultural environment of Bengal and blessed with a good voice; Anil Biswas decided to take proper lessons in music. He started to learn the Tabla, mastering the art in just a few years. Alongside, he took singing lessons from a couple of teachers and soon acquired confidence to perform as professional singer. As a teenager Anil Biswas had to run away from home; due to police persecution, as he was connected with die freedom movement He came to Calcutta., the dream city of every young Bengali with a fiver in his pocket. Those were tough times. After many sleepless nights on city’s pavements he managed to find a job as a singer, lyricist and composer (he was already working on a professional stage as a composer-singer-actor-dancer-drummer etc.) with the Hindustan Recording Company where Kundan Lal Saigal and Sachin Dev Burman were also on the company’s staff. The two seniors took a liking for the newcomer. They became good friends and the trio spent their spare time together. The friendship continued even after they had migrated, one after another, to Bombay. Anil went through many turmoils in his life, including jail terms for his anti British political activities in Calcutta where he had not made any headway in his career either. He decided that Bombay, and not Calcutta was his ultimate destination. So, in 1934 he moved to the film capital of India and found himself a job at Ram Daryani's Eastern Art Production. During his first year in Bombay he got opportunities to tune an odd song or two for films like BaalHatya and Bharat Ki Beti produced by Eastern for which he got no credit but in 1935 he was assigned to score music as a full fledged composer for Rs. 250 per month for Dharm Ki Devi in which he also sang his first Hindi song Kuch Bhi Nahin Bharosa. It was picturised on him too. Though a modest beginning, it was a turning point in his career. Two years and 11 films (mostly stunt ones) later, and after having joined Sagar Movietone luck smiled on Biswas. His compositions in Sagar’s Mehboob-directed “Jaagirdar” (1937), a commercially successful movie, established him finally as a force to reckon with. Some more box office bonanzas like 300 Days and After, Gramophone Singer, Hum Tum Aur Woh, Watan, Ek Hi Rasta, Alibaba and Aurat followed. Most of his popular movies in that period were directed by Mehboob Khan, first at Sagar Movietone and later at National Studios. The collaboration of the two giants continued during the early forties in such notable films as Behan and Roti. The story and concept of the later was by Anil Biswas. In 1942 Anil Biswas after accepting an offer made by actress -producer- studio owner Devika Rani, joined her renowned banner Bombay Talkies (B.T.). Before joining this organization he had earlier composed music for its super hit Basant but due to his contractual obligation with National Studios credit could not be given to him and instead the name of his brother-in-law Pannalal Ghosh appeared on the credit titles of the film as music director. Biswas’ first official film at B.T-, Hamaari Baat (1943) was incidentally Devika Rani’s last film as an actress. Biswas’ compositions in this film were as usual of a very superior quality. 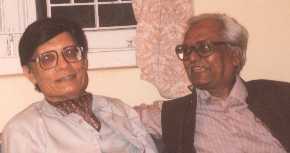 Most of the songs rendered by his sister, Parul Ghosh, brought great applause to both the singer and the composer. theatre (Plaza) in Calcutta — a record that has been broken only by Ramesh Sippy’s Sholay in the seventies. Almost all the songs: (Dheerey Dheerey Aa Re Baadal / Ashok Kumar and Ameer Bai, Papiha Re / Parul Ghosh, Aaj Himalay Ki Choti Se / Amir Bai and Chorus, Ab Tere Siwa Kaun Mera / Ameer Bai, Ghar Ghar Mein Dwaali Hai / Ameer Bai) Anil Biswas composed for Kismat became a rage throughout the country. In fact Dheerey Dheerey Aa Re Badal sung for the screen by Ashok Kumar and in the record by his cousin and singer Arun Kumar Mukherji, then Anil Biswas's assistant, is considered to be one of the finest lullabies ever presented in a Hindi film. Biswas was now at the peak of his creativity. The other notable films in which he gave outstanding music were JuarBhaata (Dilip Kumar’s debut making film - 1944). “Pehli Nazar” (1945 - which introduced Mukesh to the Indian public) Milan (1946) Anokha Pyaar (1948) Ladli (1949) and Arzoo (1950). The last one sky-rocketted Talat Melmood’s fame for his Aye Dil Mujhe Aisi Jagah Ley Chal. This was also Talat’s first song recorded in Bombay. Anil Biswas’s later films were Aaram (1951), Taraana (1951). Doraaha (1952), Hamdard (1953), Waaris (1954), Pardesi (1957), Sautela Bhai (1962) and Chhoti Chhoti Baaten (1965) he last named movie, very sensitively directed and produced by actor-par-excellence, Motilal, turned out to be the swan song for its creator. Motilal died before the film was released and crashed at the box office. Disillusioned by the changed working environment and the indifference of film makers in Bombay, Anil Biswas shifted to Delhi along with his singer wife Meena Kapoor, having accepted an important post at the All India Radio, Delhi. Anil Biswas is not only a music director, he is an institution in himself, an epitome of knowledge and authority on both the classical and the folk music. He is also well versed with the western symphonies which he has used extensively and successfully in his musical scores. The Author was the Manager (Western Region ) of the Pakistan International Airlines at Mumbai during the period 1987 – 96. 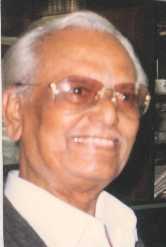 He remained closely associated with the social activities of the Indian film world including the Cine-Society and particularly Living Legend of Indian Film Music “Anil Biswas”. He has very kindly contributed for this web-site an extract from his under compilation book on “Prominent Composers of the Sub-continent”.